In the age before responsive design and fixed-position CSS, frames were a great way to divide up your web page. They enabled you to have a fixed ‘header’ with your logo and contact details, or a fixed top, left or right navigation system. When these were popular, most screen resolutions were 800px × 600px or 1024px × 768px. So knowing you could divide up the screen and keep a consistent layout was relatively easy. Nowadays, you should use responsive design because, being honest HTML Frames are old. That being said, our site is found for people searching how to do this, so let’s cover it – we aim to be useful after all! Before we jump into code you have to decide how to lay out your screen. You could use a graphics package, a wireframing web app, or just a pencil or paper. Doesn’t matter how – just create a visualisation of your layout. Keep it simple – i.e. two or three boxes at most. You must first create an individual file for each of your boxes – or as I will refer to them now – frames. Once you’ve done that we can continue! The <frameset> tag pair define how your frames will be laid out. As in the tutorial about HTML Tables, cols is short for columns. This means we are dividing the page into vertical strips. For the cols attribute you are working left-to-right. So the first percentage is the first ‘strip’ and the second belongs to the second ‘strip’. You can use absolute numbers – so cols="200,600" would divide up a screen which is 800pixels wide into one frame of 200 pixels and one frame of 800 pixels. In today’s technological environment where screen sizes vary massively, if you’re going to use HTML Frames, please use percentages. noresize: If you don’t specify this then users will be able to resize your frames at will. This can cause layout issues so it is usually a good idea to prevent that behaviour. Notice with this attribute there is no ="". That’s because there’s only one setting. So just having noresize is the same as defining noresize="noresize". Both are fine. scrolling: Do you want users to be able to scroll this frame? In the case of your navigation, maybe not. On a frame-by-frame basis you can turn off the user’s ability to scroll that frame, which can be very useful. name (highly recommended): give each frame a unique name. This is vital for frames based websites in order for your links to work correctly. See below for more information. frameborder (highly recommended): set a thickness of the border. Apart from some messy CSS, you can’t style your frame’s border, so you’re left with whatever the browser in question gives you. That makes the most common use of frameborder to be frameborder="0" which makes them invisible. This is an alternative layout method, allowing you to divide up your page into rows, instead of columns. In this case you are using rows instead of cols. And instead of left-to-right, your <frame> tags work top-to-bottom. Link 3 In this layout we have multiple framesets and multiple frames. Code snippet is below! The first frame tag populates our first horizontal section. It loads top-frame.html and gives it the name topFrame. We disable scrolling on this one. And lastly, once you’ve closed the second frameset, you can pop in the last <frame> to populate the footer. And remember, you have to have four separate HTML files plus your frameset file to achieve this! The last thing I want to cover here is that of links. The reason you should set a name attribute on your frames is so that links work correctly. If you do not define the target attributes, links will open in the same frame the link is in, which could overwrite your header, footer or navigation! Not ideal. However, if you set target="contentFrame" then the link with that attribute set will open up in the frame with that name. You must remember to do this on all your links to ensure your layout is maintained. 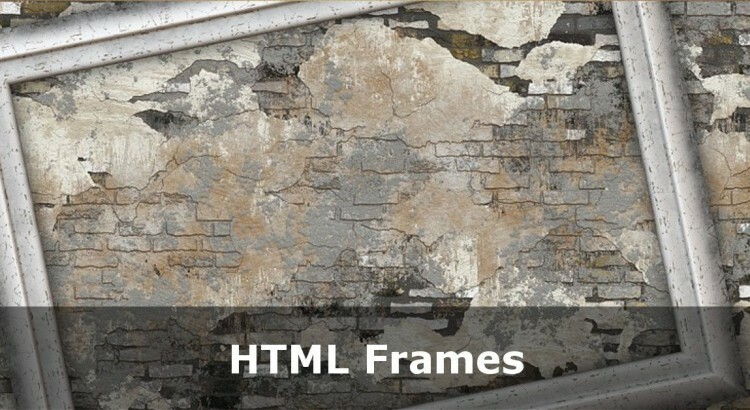 HTML Frames are now an old way of laying out websites. I re-wrote this tutorial because I know people find us when they are looking for them in search engines, but in reality you should stop trying to lay out your websites in this way. Each individual frame will get indexed separately by search engines. This means people could land on one ‘bit’ of your page and not get the full layout. Frames are not mobile friendly. Even if you use ‘rows’ instead of ‘columns’, frames make scrolling through your content much harder on touch-screens. Each frame file must refer separately to your CSS Files via the Link Tag. This makes updating your pages more labour-intensive. Making a nice smooth design is really hard work if using images as part of your design. This is because matching up frame edges becomes harder, especially on large screens. To update one ‘page’ may involve updating 3 or more files – again more work for you. What Should You Do In Place of Using Frames? Since writing this tutorial, I have added a couple of alternatives. One is to use HTML Tables for Page Layout, which avoids a lot of the pitfalls of frames. However tables make responsive design (mobile-friendliness) really difficult. The other approach is much more fluid and more up-to-date and that is to use HTML5 and CSS3 to create a layout without frames or tables. I hope this tutorial helped you but if you have any questions, just hit the button! Okay, so this happened to me, but as a newbie trying to learn HTML your article doesn’t point out a preferred approach to making a website without frames. Would it be better I use or to group content, and then arrange them with CSS? Thanks – I will try to remember to update this tutorial to help it be clearer for people. Have a look at web page layout without frames. If you’re confident with CSS then go for that. In the least you should run with a table layout, but that has restrictions for responsive design. So you’re better to use fluid elements (like DIVs) and then use CSS to achieve the layout you’re looking for. how can I display my d/t types of document by using links on one side of window& links on the other window?please!! help me it is my assignment for tomorrow!!! Hope this helps. If not I’ll be back on in a few hours, so feel free to reply to this thread. Please post all the different ways to divide a webpage. so i get it easily and soon. Thanks for your comment! However the number of different ways you can divide your page is determined by the size of screen being divided. That makes it an almost infinite number of ways! You’re limited only by screen size and your imagination, so feel free to go wild. Just be careful of nesting too many at once as you can cause an infinite nest, or have to create many HTML pages to put in them. but it can be open by using the _blank tags… but i need that google link word and the side should be open in same site page within frames/…. what should i do? That might be a restriction on what Google allow you to do – i.e. you might not be allowed to embed Google Search in a frame. I’ll run a test myself and get back to you. Hi there, I have just run a test and am able to embed other sites in a frame but not Google, so I don’t think you’re allowed.